Today, Danielle is talking about the Volton crest. I remember the first time she showed it to me, and I thought it fit the Voltons so well. Holt and Mars are two of my favorite tertiary characters in the series. They're men who've dedicated their lives to serving others, but they're not completely altruistic. Since they have their own behind-the-scenes situations that drive their actions, they make for complex characters whose actions help shape the three main characters. While we can safely say the Voltons are not spiritual leaders, they have a strong impact on all of the kingdoms, and they’re a group Elder Werrick would like to see diminished. Voltons are what I consider a splinter group of the Ecclesiastics. I believe that maybe there was only one group—the Ecclesiastics—but after a time greed, power and control started poisoning the group. At this point, a few disagreed with the practices and felt they could better serve the kingdoms through five disciplines (medical, agriculture, teaching, kingdom and dark arts). As the Ecclesiastics pushed more of their agenda on the kingdoms, the Voltons stepped up and provided much needed services for all. Many Voltons even make it a point to live in the kingdoms, not just try to control them. Through the series, we meet and hear from many Voltons, but we get the deepest glimpse into Volton Mars’ life. He is a trusted adviser, tutor, medical professional, and friend to the Ethereal royal family. We see his deep connection to everyone in the family, especially when he tirelessly saves Wil's life. This man may be a Volton, but he loves the Ethereals too. Voltons are supposed to remain neutral, and the ones we see do a good job at that. Mars won't divulge any Outlander secrets even though he knows his “family” is heading into danger. The same goes for Volton Holt; although he does let a few things slide like when he catches Layla snooping in his study. We also see the compassion this group has as they care for released prophecy candidates and how they take in refugees like Grant and Samson's parents. On to the crest! This crest has 3 main parts; the elemental symbol for earth, an hourglass-like shape, and a scroll. The symbol for earth was chosen because of all the groups, this one is the most grounded of all. They do not rely on traditions but study them. They do not take sides but live within all the kingdoms. Their goal is knowledge, and they use that knowledge for the good of all, not for any specific group. 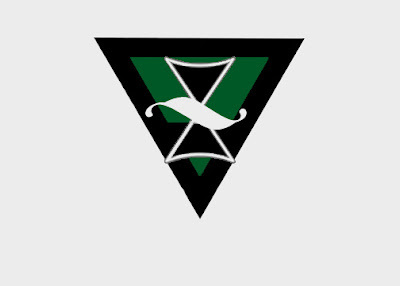 The hourglass-like shape in the center symbolizes balance, which would fit in with the Voltons as they are a balancing force within the kingdoms. The specific shape I chose looks a lot like an inverted triangle balancing atop another. The scroll was added to show that they base everything in fact and greatly value knowledge. The Voltons even have dedicated wings in their main building for each discipline, and all new Volton trainees must rotate through all five before choosing their life's work. The color green was chosen for many reasons. Green is associated with renewal and growth. It alleviates nervousness and is soothing and relaxing. Green also brings with it a sense of hope, health, and renewal, as well as self-control, compassion, and harmony. All of these traits can summarize the Voltons. Also, green is my favorite color! Stay tuned, the next and last crest post will share the insights into the Outlander crest and maybe even some secrets that were instrumental in my creating the crests. Remember, the last book in the Fulfillment series will be available on October 15th. See you next time! Thanks so much! This one is actually my favorite of the 5, which I am not sure I ever said that before. The crest posts are from 10/5 - 10/9 on Erin's blog and each day shows a different crest. Enjoy!